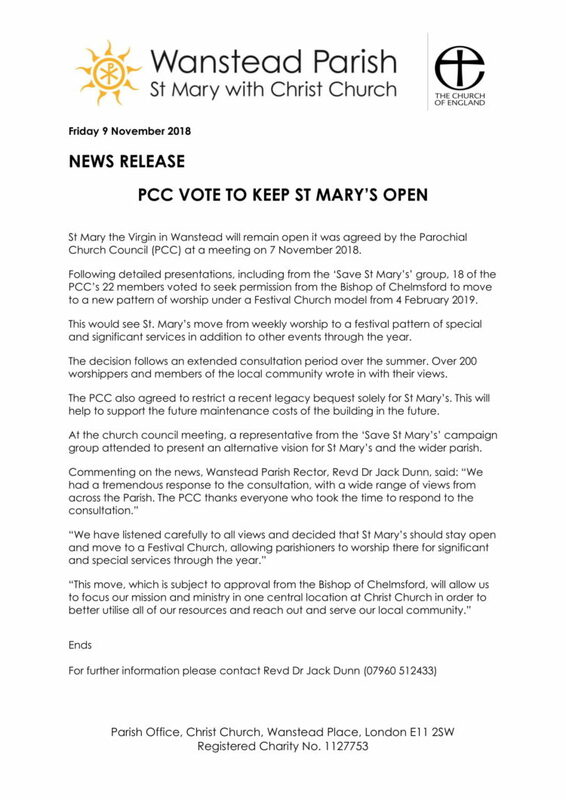 St Mary the Virgin in Wanstead will remain open, it was agreed by the Parochial Church Council (PCC) at a meeting on 7 November 2018. Following detailed presentations, including from the ‘Save St Mary’s’ group, 18 of the PCC’s 22 members voted to seek permission from the Bishop of Chelmsford to move to a new pattern of worship under a Festival Church model from 4 February 2019. This would see St. Mary’s move from weekly worship to a festival pattern of special and significant services in addition to other events through the year. The decision follows an extended consultation period over the summer. Over 200 worshippers and members of the local community wrote in with their views. In a letter to parishioners, the Rector further explained that the parish will be holding a number of drop-in surgeries for our worshippers in Christ Church vestry from 2 to 4pm on 11th November and from 7 to 9pm on 13th November, 28th November, 10th December, 14th January and 17th January. If you would like to attend one of these please telephone the parish office (0208 530 8743) or drop Father Jack a line, copying in Lorraine in the parish office.